Last night (31 October) we attended Merton’s Design Review Panel. This committee includes architects and others who know about building design. Its role is to look at planning applications, either before they are lodged with the council or while they are live, and give guidance on their design quality. On 31 October it looked, for the second time, at the proposals for a canopy for Mitcham market at Fair Green. This has been put forward by Merton Council as part of a much wider range of plans under the umbrella of Rediscover Mitcham. The Design Review Panel had seen the market canopy before – in July. At that time the canopy had not been formally submitted as a planning application – it was in the ‘pre application’ phase, and the Design Review Panel meeting was in private. Its notes were only published after the canopy became a live planning application, and only made available with the other materials relevant to the planning application after we had put in a Freedom of Information request. This time, because the canopy is now a live planning application, the Design Review Panel met in public. People were allowed to attend and observe – but not to speak. We had a representative at the meeting, and we can tell you what we heard. Note as you read what follows that the official report is not yet published. It has to be written up by an officer of the council and then approved by the panel members. As you read our report of what the Design Review Panel said, bear in mind that it gives every application it considers a rating – green, amber or red. Green is good. No application wants to be rated red. Last time the market canopy got an amber rating. This is a building being made by the local authority and should be to the highest standard to set an example for others. It is far from being a high standard building. The use of polycarbonate (a type of plastic) for the roof is a bad idea. It ages quickly – about ten years was suggested, and is not suited to permanent structures. The buildings at Fair Green surrounding the market space are generally of a low architectural standard, and this new one would do nothing to change that – one person used the word ‘shed’ to describe it, another said it looked like ‘a cheap bus shelter’, another that it was going to get ‘tatty’. Despite being invited by the chair to say something positive about the canopy and to offer constructive support for the design, nobody on the panel seemed to have a good word for it. The canopy was given a red rating. We hope the notes of the Design review Panel meeting are written up fast, because the next step for the canopy is the Planning Applications Committee on 7 November. We think it is vital that all the Councillors on the Planning Applications Committee see the full report to help inform its decision. As things currently stand, Merton’s Officers have recommended to allow the canopy. Their own report on the planning application was published before the Design Review Panel met. We think this shows complete disregard for the panel. The officers report was also published before the deadline for all public comments, showing disregard for what the public say too. All this has happened, we think, because Officers want to rush the canopy through the planning system so they can spend the money to build it by the deadline that’s been imposed by the external funding source. The shortage of time does not, in our mind, excuse bad practice, and we have taken our concerns up at the highest level within the council. Just as a member of the Design Review Panel said council builds should be of the highest quality, we believe council planning applications should be dealt with to the highest standards, and Merton council has fallen well short. Although the official deadline for comments is 1 November, Merton council does tend to accept comments made after that, so if you feel strongly after reading this you may still contact the council and make your views known – but be quick as the planning committee meets on 7 November. All the information you need on how to do this is at Merton Council’s web site, and the planning application number is 13/P2575. 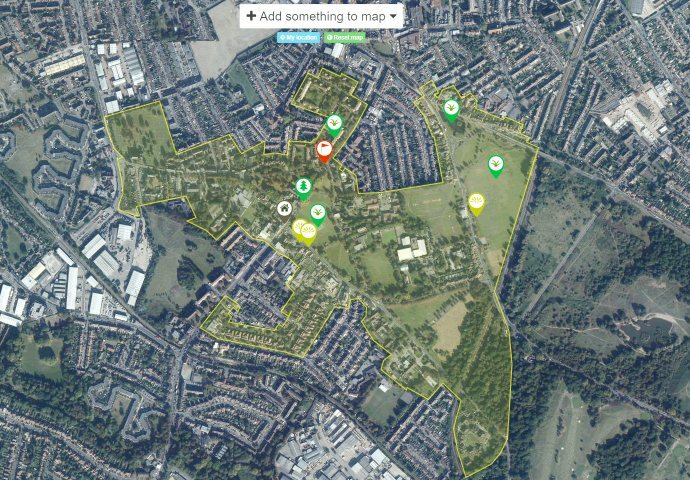 This entry was posted in Cricket Green Conservation Area and tagged design review panel, Fair Green, market canopy, Planning Applications, Rediscover Mitcham on November 1, 2013 by mitchamcricketgreen.